(Nanowerk News) A study released this week suggests that anti-cancer chemotherapies which use nanoparticles to deliver drugs deep inside tumor tissue will be more effective if the particles are positively electrically charged because they are taken up to a greater extent by proliferating cells, according to a team of chemists and chemical engineers at the University of Massachusetts Amherst. This is because a positive surface charge allows better uptake of the nanoparticles across the cell membrane, a mechanism which the researchers found controls delivery to most tumor cells. At the same time, “negative particles, which diffuse more quickly, may perform better when delivering drugs deep into tissues,” say UMass Amherst’s Neil Forbes, with chemist Vincent Rotello and colleagues. Their description of a new “tunable” delivery system appears in the current issue of Nature Nanotechnology. UMass Amherst researchers invented 2-nanometer core gold particles, designated “payload” in the cartoon above, which can be coated with different surface materials such as green fluorescent dye (pictured) or anti-cancer drugs, giving them “tunable” properties and functionalities. In the study reported this week, Forbes, Rotello and colleagues found that positively charged gold nanoparticles crossed the cell membrane more readily than negatively charged particles, indicating a promising new approach for improving drug delivery to the majority of cells within tumors. It was already known that lack of delivery precision is a key limitation in chemotherapy, says Forbes. Solid cancers often have irregular blood vessel arrangement, for one thing, which means there will always be some cells that escape the chemotherapy. But by experimenting with different payloads carried on the gold nanoparticles in the new tumor cylindroid device, Rotello, Forbes and colleagues have found that tunable gold nanoparticles have great potential to overcome such obstacles because they are small, diffuse easily through the tumor, and are less toxic to the body than other molecules. 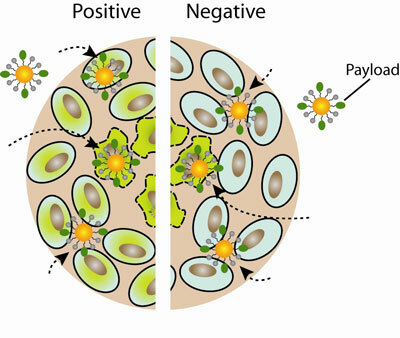 In mathematical modeling and experiments testing the efficacy of several conditions: drug or dye with no particles; particles coated with fluorescein dye, positive or negative charge; and particles coated with anti-cancer drug doxorubicin, positive or negative charge, the UMass Amherst researchers show that gold nanoparticles move and localize differently in the 3-D cylindroid tumor tissue, depending on whether the nanoparticles are positively or negatively charged. Further, they say that under most circumstances, positively charged nanoparticles will improve delivery to the majority of cells within tumors, whereas negatively charged particles would perform better when delivering drugs deep into tissues because they diffused at a faster rate. “The mathematical models suggested that the rate of cellular uptake of both particles was fast in apoptotic and necrotic tissues. Furthermore, the uptake kinetics of positive particles is irreversible, but is reversible for negative particles over the timescales investigated,” they write. Overall, Rotello, Forbes and colleagues summarize, “the ability to tune surface charge to control tissue penetration and drug release makes gold nanoparticles a flexible and powerful drug delivery vehicle” and that uptake, not diffusion, is the dominant mechanism in particle delivery. “What we were able to do is to get more drug into the cells with the positively charged particles than with negative or with drug alone,” Forbes adds. The modeling and experiments were supported by grants from the National Institutes of Health and the National Science Foundation.